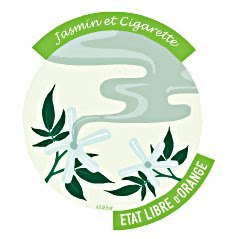 For Etat Libre d’Orange, whose store is north of Hôtel de Ville in Paris, Antoine Maisondieu has performed a masterful trick. With Etat’s creative director, Etienne de Swardt, he has taken two radically dissimilar concepts and balanced them so that they are perfectly integrated and astonishingly distinct. The first is a fragile, delicate jasmine (stripped of the dirty indolic heaviness that the flower usually leaves behind). The second is a pitch-perfect cigarette. Not the stink of a filthy ashtray. (That, says Maisondieu, an ex-smoker, is "disgusting”) This is the smell of an elegant Frenchwoman in a cafe whose grayish-white plume mixes with the chic jasmine fragrance she just sprayed on. His perfume is named Jasmin et Cigarette, and it is the quintessential French combination: allure and toxicity, loveliness and poison. I asked Maisondieu how he did it. "It’s simple,” he said with a shrug. "We all know how to do a jasmine: Egyptian and Indian jasmine absolutes, some Hedione” — a molecule that adds light to a perfume — "some benzyl acetate for softness.” He paused. "The cigarette was a bit more complicated.” He used to love unfiltered Chesterfields "in the soft box, which have a slight apricot.” So he used hay essence, tonka bean (a flavoring in tobacco), maté from South America, galbanum (a raw green) and sage. The result is a masterpiece: one hears laughter in the cafe, with the faint sound of music from somewhere else.